The TS-910 is a Central unit of the Integrated conference system designed for use with both the Wired and Infrared conference units in combination. 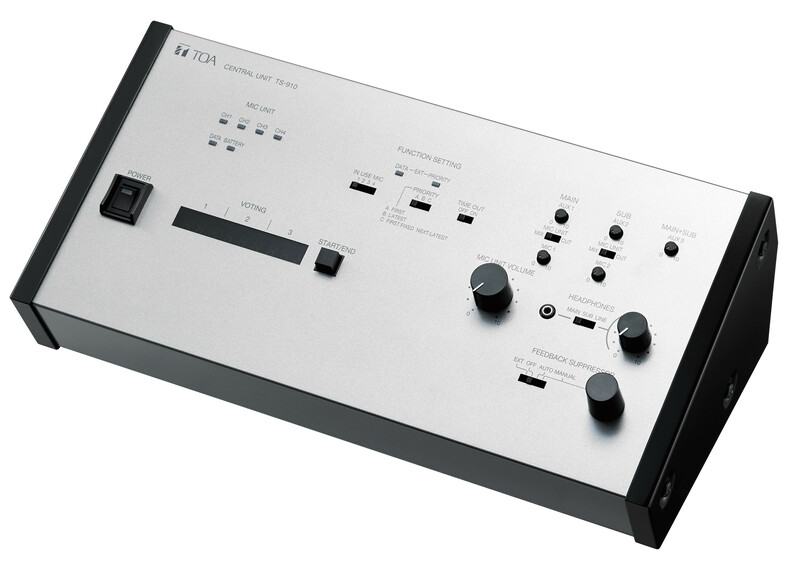 Connecting to the Expansion unit and Infrared Transmitter/Receiver unit, the TS-910 can control the conference units. Up to 192 Wired and Infrared Conference units in total can be used per system. The incorporated Feedback suppressor (FBS) function helps to effectively suppress acoustic feedback. External control, voting result confirmation, and equipment installation confirmation can be performed on a PC. Also, 2 channels of audio signal lines are provided for base language and translation language. With the use of an optional rack mounting bracket, it can be mounted in an EIA Standard “equipment rack (4 unit size).